Just out of interest I've had another play with the manoeuvre on paper and it still doesn't seem right to me. I would have thought that he would need to brace the foresail to be on the larboard tack and turn the rudder to larboard as well (not both to starboard). The foresail would offer little turning moment (its yard being in line with the wind), but the combined effect of the tide on the rudder and the backed spritsail might just bring the head round sufficiently for the foresail to fill, which would then bring the ship to drift downtide at right angles to it, facing the town, where it would effectively be in stays. Clubhauling on the kedge is then the obvious way to bring the stern into the wind and cause the sails to fill - though the main would probably blanket the foresail so that it hung limp unless the wind was well on the beam, which does not square with it being a northeaster as the ship moved downchannel past Alcantara. In such a situation everything would depend on the relative strengths of wind and tide (the latter usually having more effect, and the large windage of the high hull more than offsetting and countering the pull from the foresail). It shows what despite the title is actually the same carrack on different points of sail (the wind is coming from many different quarters all at the same time!). 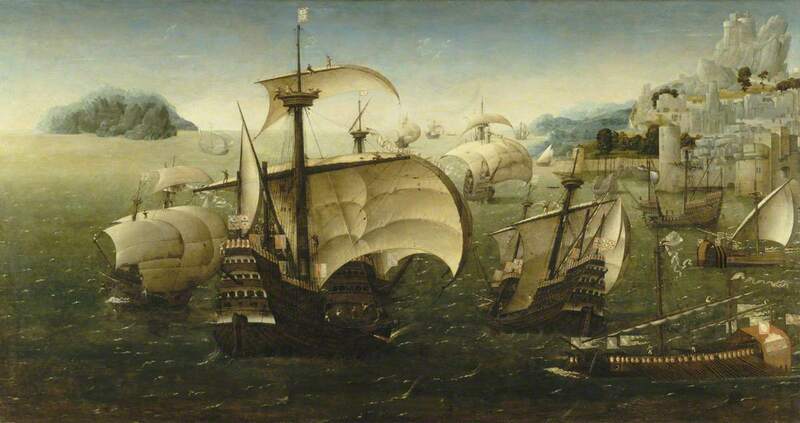 Note the human figures are to half scale, just to make the ships look more imposing. I'm pretty sure the scene is a fanciful adaptation of Lisbon. There's also a nice little reference to the caravela latina, with one putting out from the shore. 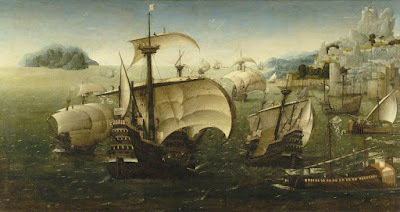 One day soon, I hope to on the caravel Boa Esperanca. The rig is reputedly a pig to sail downwind but a dream into the wind. I have posted Graham's comments here to give interested translators an indication of the depth of understanding that is sometimes required to understand a text in depth to the point of having the confidence to query the author's version.